At the height of picnic season everyone simply must try recipe barbecue chicken drumsticks. Plain meat, like pork or beef, often turns harsh. And chicken is always soft — is another matter. Zamarinovat pieces in the right way, it's time to go camping. chicken drumsticks — 2 lbs. Wash the chicken drumsticks in cold tap water, remove the feathers, if any. Put the chicken in the pan, add chopped onion and mix all thoroughly with clean hands. Now pour the meat, mineral water, soy sauce. Pepper and salt to taste. Let the drumsticks are marinated in this form for at least two hours. And if time allows, leave a container of meat overnight in the refrigerator after covering it with something. Cooked meats take on nature. Build a fire, let the wood burn better and when the coals are ready, lay the drumsticks on the grill. Fry the skewers on all sides until Golden brown, turning it occasionally so as not burnt. 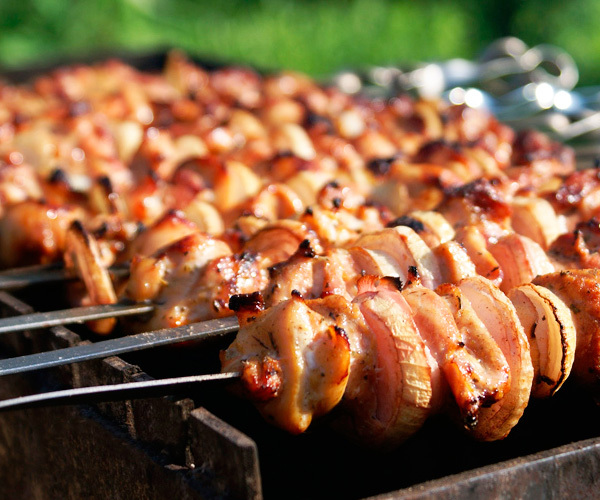 That the meat was more tender, juicy and soft, bring a squirt bottle filled with water. In the cooking process not very far from the fire, occasionally slightly sbryzgivaja meat. Find something you could use as a fan. Alternate sprinkling with water and fanning the heat on the coals. For fans of skewers: Shin is better to cut into two parts, then implanted as usual chunks of pork or beef. Skewers better to use a flat on them the meat will spin. If in some place on the coals will begin to burn the fire, carefully pour a small amount of water. It is not necessary to stick with chicken meat additionally some vegetables, onions and so on. All of it will burn before unseemly and inedible state. If you want to cook vegetables on the fire, make a separate skewer with vegetables or heat them separately on the grill, after the meat.